We are a small hobby breeder in New Tecumseth, Ontario, just forty five minutes from Toronto. 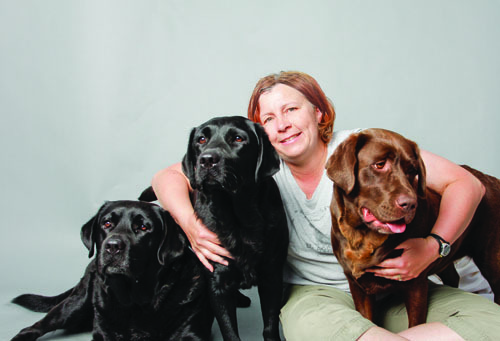 Our dogs all live in the house and are loved family pets as well as accomplished show, field and obedience competitors. Our breedings are limited, about one litter per year. 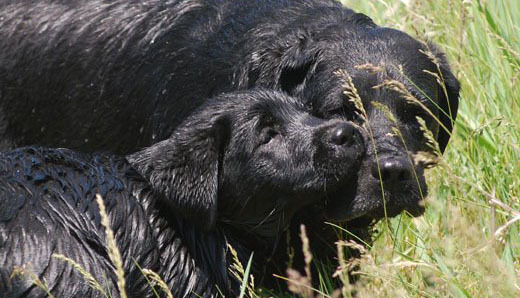 We breed with the goal of producing puppies with outstanding natural hunting and working ability that still adhere to the Labrador Retriever breed standard. Most of our dogs are titled in the conformation ring, obedience ring and in the field in Ontario, across Canada and in the US. We currently breed blacks and chocolates. For optimum health and longevity, we feed a natural raw diet that is free of preservatives and grain products as these can contribute to diseases such as cancer and arthritis. We avoid vaccinations (with the exception of vaccinations required by law) and the use of chemicals and pesticides such as flea and worm preventives. We have been raising our Labradors naturally for nearly fifteen years and have discovered that true health is not just absence of disease. Dogs with strong immune systems are less likely to be hosts for ticks and fleas, and less likely to suffer chronic, debilitating disease. Our puppies are raised in our home where they are exposed to household sights and sounds. As a dog behaviourist, I know that socialization is important for puppies to become sound and calm adults. Our puppies are exposed to many different surfaces, many novel places such as shopping malls and training classes, and have Biosensor exercises done for the first two weeks in an effort to make them as temperamentally sound as possible.